Unerringly seeing the nature of dharmas and dharmata just as it is, You expand the wisdom of omniscience And give glorious bliss to the minds of all beings. Rikpe Dorje, we supplicate at your feet. – from the Supplication to the Karmapas. The sixteenth Gyalwang Karmapa, Rangjung Khyapdak Rigpe Dorje, was born in Denkhok of the Derge province in east Tibet, the son of a noble family called Athup. Having received instructions from different masters in Derge that she would bear a great bodhisattva son, his mother had gone to stay in a holy cave, once used by Guru Rinpoche, where she waited to give birth. She was accompanied by a Khenpo who instructed her on the cleansing ceremony. 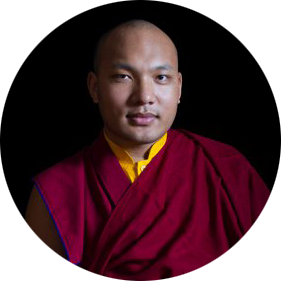 It is said that, at one point at the very end of the pregnancy, the future Karmapa disappeared entirely from his mother’s womb for a whole day. The day of his birth, his mother returned to normal pregnancy size and soon gave birth to this great bodhisattva. Those present heard him say to his mother that he would be leaving soon . The details of the birth coincided precisely with those of a prediction letter given by the Fifteenth Karmapa to his attendant, Jampal Tsultrim, which set forth the circumstances of this new incarnation. Jampal Tsultrim handed the letter to the authorities at Tsurphu monastery, who then asked Tai Situpa, Beru Khyentse, and Jamgon Kontrul to clarify certain points. A search party subsequently located the incarnation. The Eleventh Tai Situpa soon recognized the child as being the new reincarnation of the Gyalwang Karmapa and sought confirmation from HH the Dalai Lama. The Karmapa received first ordination and then bodhisattva vows from the Tai Situpa and Jamgon Kongtrul Rinpoche, the two foremost disciples of the Fifteenth Karmapa. Eventually, the Dalai Lama gave his acknowledgement. While still residing in Derge, when he was eight years old he received the Vajra Crown and ceremonial robes of the Karmapa brought to him from Tsurphu. On the way to Palpupng Monastery, he stopped to visit and bless the Derge Monastic Publishing House, foreshadowing his publication of the Buddhist cannon in India. T’ai Situ Rinpcohe enthroned him as the Sixteenth Karmapa, Rangjung Khyabdak Rigpe Dorje, by Tai Situpa. Tai Situpa then accompanied him on the long journey to Tsurphu, the seat of the Karmapas in central Tibet, where the new incarnation was greeted by Goshir Gyaltsab Rinpoche, Jamgon Kongtrul Rinpoche and Nenang Pawo Rinpoche. Soon after his arrival at Tsurphu, the sixteenth Karmapa was received by the Thirteenth Dalai Lama who performed the “hair-cutting” ceremony. While so doing, the Dalai Lama had a vision of the ever-present wisdom-crown on the Karmapa’s head. After this ceremony the Karmapa was officially enthroned at his main seat of Tsurphu, by Tai Situpa and the Head of the Drukpa Kagyu school. He received the full Kagyu lineage transmissions from Tai Situpa Pema Wangchok Gyalpo and Jamgon Kongtrul Palden Khyentse Öser. The Sixteenth Karmapa then studied many sutrayana texts with Gangkar Rinpoche and tantric teachings with Khyentse Rinpoche. He received the mahamudra transmission from Jamgon Kongtrul Palden Khyentse Öser, and many other great masters of the time. Karmapa then visited the Lithang Pangphuk monastery, where, in the tradition of the Karmapas and their inconceivable activity, he is said to have left footprints in solid rock. Here is a brief summary of some of the key dates and inconceivable activities of the of the 16th Karmapa’s life, a master how had a profound and lasting effect on almost everyone who came to encounter him. 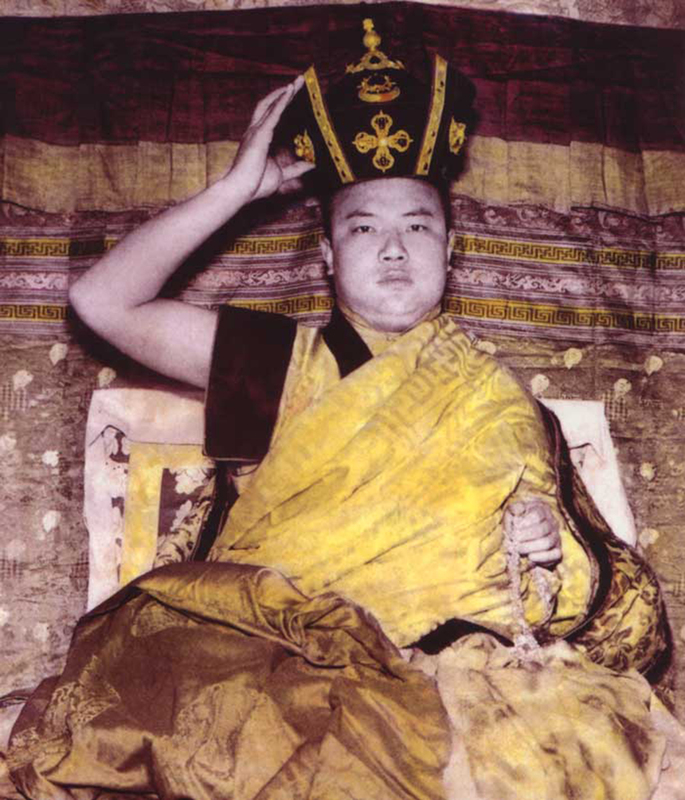 The 18-year old Karmapa returned to Tsurphu and between 1941 and 1944 spent much time in retreat. Tsurphu monastery was extended in size during this period. Beginning in 1944, His Holiness began to strengthen relationships with neighboring Buddhist states in the Himalayan region, as well as with India. During a pilgrimage in southern Tibet, the sixteenth Karmapa accepted an invitation from His Highness Jigme Dorje Wangchuk, the King of Bhutan. The Karmapa and his party then visited Bumthang (in northern Bhutan) and other areas in Bhutan, engaging in many spiritual activities. The Karmapa and his party continued their pilgrimage to Nepal, India, and Sikkim (India), visiting the major places of the Buddha’s life: Lumbini, just inside Nepal where the Buddha was born, Benares (Varanasi) where he first taught, and Bodhgaya, the place of Buddha’s enlightenment. After travelling through Kinnaur (Himachal Pradesh in northern India) and Purang to visit Mount Kailash, His Holiness returned to Tsurphu Monastery in Tibet. With His Holiness the Dalai Lama, H.H. the Sixteenth Karmapa and other high lamas of Tibet visited China. The Sixteenth Karmapa subsequently returned to Tibet, stopping along the way at many monasteries in eastern Tibet. The Karmapa and party traveled to Sikkim and from there continued on pilgrimage. H.H. the Dalai Lama, H.H. the Panchen Lama, and H.H. the Karmapa visited India, at the invitation of the Mahabodhi Society of India, to join in the celebration of the 2,500th anniversary of Buddhism. During this trip, the Karmapa and his party revisited the holy sites of India as pilgrims. During this visit, the Karmapa strengthened his ties to his disciples Tashi Namgyal, the King of Sikkim, and Ashi Wangmo, the Bhutanese Buddhist princess. The King of Sikkim invited him to visit Rumtek, a monastery in Sikkim that the ninth Karmapa had founded at the end of the 16th century. His Holiness was unable to accept his invitation at that time but said that he would go there in the future, when it would be needed. Foreseeing the communist Chinese invasion of Tibet, and the inevitable destruction of Buddhist institutions in Tibet, the Karmapa informed the Dalai Lama of his intention to leave his homeland in the spring of 1959. The Sixteenth Karmapa, accompanied by a large entourage, left Tsurphu, and fled Tibet. The escape was organized by Dhamchoe Yondu, the General Secretary for His Holiness. The party also carried with them the sacred statues, paintings, reliquaries, and other precious items of the lineage of the Karmapas. The timing and organization of the departure made for a relatively easy journey to Bhutan. After three weeks, the party arrived safely in northern Bhutan, where the most senior Bhutanese government officials received them. The Choegyal (King) of Sikkim extended a formal invitation to His Holiness to set up his seat in Sikkim, and two months after entering Bhutan the party arrived in Gangtok, Sikkim. Of the several sites proposed by Choegyal Tashi Namgyal, the Karmapa chose to settle at Rumtek. The Karmapa stated that Rumtek could be his seat outside Tibet, although he hoped one day to return to Tibet. The Karmapa and his party left Gangtok for Rumtek shortly after the Choegyal extended his offer to settle in Rumtek. Although Rumtek monastery had been established many centuries earlier by the ninth Karmapa, by 1959 it lay almost in ruins. The area around Rumtek was also undeveloped and had no facilities for supporting the Karmapa and his party. The Karmapa, teachers and community lived in temporary quarters for many years, while His Holiness gathered resources to begin construction of new facilities to support his monastic seat and the lay people surrounding the monastery. Construction of a new monastery and other facilities for the Karmapa’s monastic seat in Rumtek began in earnest three years later. The foundation stone of the new monastic center was laid by the new King of Sikkim, who had assumed responsibility for the kingdom after the previous Choegyal had passed away. Construction was led by the General Secretary for His Holiness, Dhamchoe Yongdu. It was funded primarily through the generosity of the Sikkimese royal family and of the Indian government, the latter occurring after the Karmapa’s meeting with Pandit Nehru. H.H. the Sixteenth Karmapa set out on his first world tour, visiting the United States, Canada, and Europe. Accompanied by other teachers, a full entourage of monks and other staff, he performed the Vajra Crown ceremony in the Western hemisphere for the first time, gave empowerments, and dispensed dharma advice. In mid-January, H.H. the Sixteenth Karmapa flew to Rome and met with His Holiness the Pope Paul VI. His Holiness the Sixteenth Karmapa again traveled to the West for a more extended visit, follwed by a wide-ranging world tour. He visited religious centers in four continents and met heads of state, heads of religion, elders of many traditions and people from the world of arts. The Karmapa was given a palace and a large piece of land upon which to establish a major monastery by the royal family of Bhutan. The Karmapa strengthened his ties with Bhutan over these early decades. On November 28th, H.H. the Sixteenth Karmapa laid the ground for the construction of Karmae Dharma Chakra Centre southeast of New Delhi, at a ceremony attended by the President and Prime Minister of India. The Centre was envisioned as a study, meditation, and translation center . In May 1980, His Holiness the Sixteenth Karmapa began his last world tour, travelling through Greece, England, the United States, and Southeast Asia. During this tour, H.H. 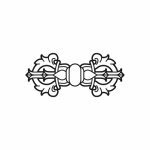 gave teachings, Vajra Crown Ceremonies, empowerments, interviews, audiences, and engaged in many beneficent activities. H.H. the Sixteenth Karmapa passed away into parinirvana at the American International Clinic in Zion, near Chicago, Illinois, USA. His Holiness’ kudung (body) was flown back to India. Karmapa’s cremation ceremony took place in Rumtek monastery. Indian dignitaries and several thousand of his disciples from all over the world attended the services. A general Karma Kagyu meeting was held in Rumtek at the request of Mr. Dhamchoe Yongdu, the General Secretary to the 16th Karmapa. He requested Shamar Rinpoche, Tai Situ Rinpoche, Jamgon Kongtrul Rinpoche, and Goshir Gyaltsab Rinpoche to form a council of regents to take joint responsibility for the spiritual affairs of the Karma Kagyu lineage. He also asked them to locate Karmapa’s instructions concerning his next rebirth and thus bring forward his next incarnation. The four Rinpoches accepted the task and expressed their sincere desire to fulfil the wishes of the Sixteenth Karmapa. The 17th Gyalwang Karmapa oversaw the collection of hundreds of photos to celebrate the anniversary of the 16th Karmapa. These were presented in a beautiful photo journey and played at the Kagyu Monlam – truly liberation upon seeing. You can view the slideshow in the video below.